Bandos Maldives offers newlyweds the perfect package for their honeymoon retreat. A coral island in the middle of the Indian Ocean, away from the hustle and bustle of daily life. In the middle of the beautiful Indian Ocean lies the island of Bandos. A picture perfect paradise hidden away from life’s everyday stresses. The clear blue water, vibrant plant life and white sandy beaches create an immediate feeling of tranquility for any newlywed couple. 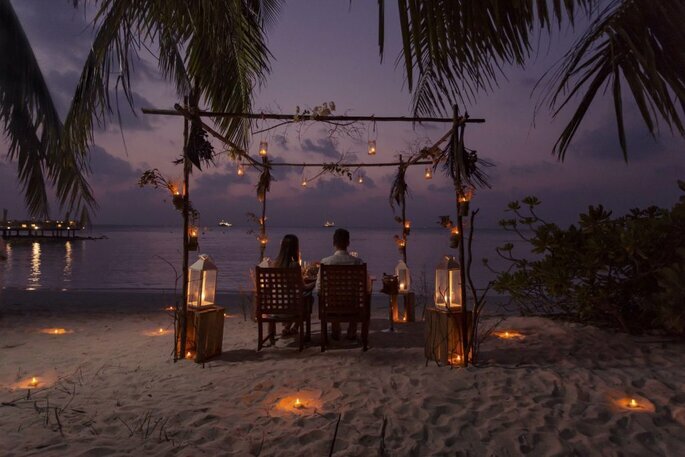 For many, the Maldives promises paradise, and a destination perfect for your ideal honeymoon location. 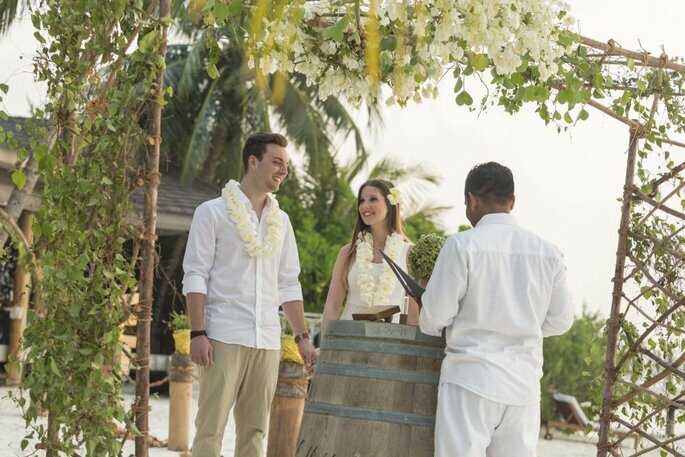 Romantic and exciting, with chances to explore the island and be thoroughly pampered, the Maldives boasts a plethora of opportunities and experiences perfect for newlywed couples on their honeymoon to experience together. Here at Zankyou, we feel that we have found a gem which offers all of this and more. 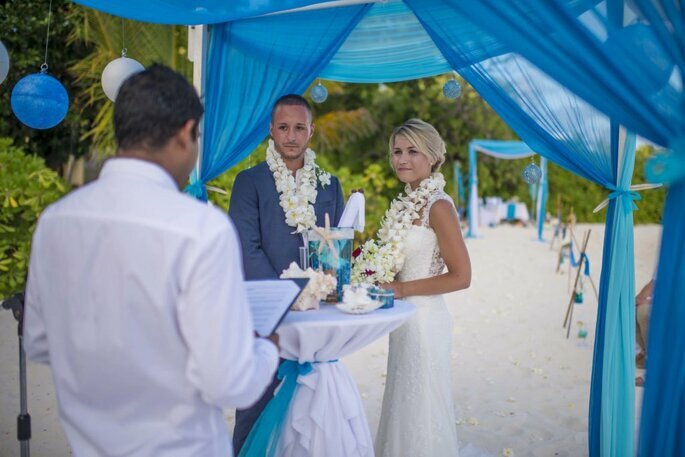 Bandos Maldives offers newlyweds the perfect package for their honeymoon retreat. A coral island in the middle of the Indian Ocean, away from the hustle and bustle of daily life, Bandos Maldives has it all. With spa treatments, salons, a freshwater swimming pool and a multitude of experiences on offer to keep you entertained all day and all night, you can guarantee an amazing first holiday as newlyweds. The experiences at Bandos Maldives include glass bottom boat tours, sunset dolphin cruises and the opportunity to go snorkelling. But what makes Bandos Maldives stand out from the rest is that it offers the opportunity for couples to go island hopping, to discover local islands and see real life in action on the beautiful islands. All of these experiences strive to help you discover the magic of the Maldives, and experience the uniqueness of the island first-hand. Bandos Maldives offers a huge range of bars and eateries that will leave you spoilt for choice: The Pool Bar where you can swim up to order your drink; the Gallery Restaurant, offering the choice of both international and local cuisine and the Koon Thai Restaurant which offers authentic Thai cuisine that you may enjoy whilst overlooking the beautiful views of the resort’s lagoon. And keep in mind: their service is so good, it’s earned them the reputation of the ‘Island of Hospitality’. And if you’re not impressed by the food options, then don’t worry because they have something for everyone. The villas provided range in size; from the standard room to the aptly named Jacuzzi Pool Villa. The range of Villas, in particular, offer stunning views of the beaches and lagoons, and, as well as being spacious, they are supplied with all of the amenities required for you and your partner to be as comfortable as possible during your stay. Bandos Maldives are, without doubt, the ones to turn to for a honeymoon that is packed with unique experiences, stunning accommodation and the most picturesque backdrops. 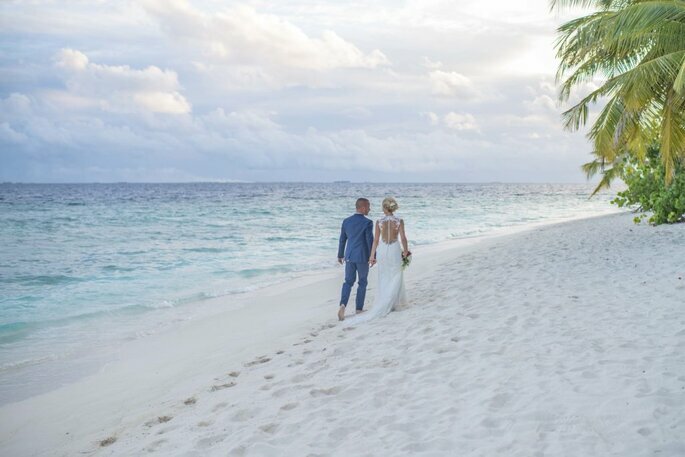 From the moment you arrive you will see firsthand the pearly white sand, crystal blue waters and lush green vegetation of the Maldives, and with award winning hospitality, what more could you ask for to make your honeymoon an unforgettable experience!